Popcorn used to be my favorite snack as a kid, definitely being eaten daily after school, and sometimes willingly being subbed out for meals. Did anyone else have such an obsession with the kettle corn microwavable packs? Seriously, I love popcorn. I was heartbroken after reading Food Babe’s article on Why Microwave Popcorn Is An Absolute Health Nightmare, so I quickly made the switch to air popping my own. It took some time to get used (i.e. burning a lot of batches), but have finally been able to reproduce microwavable kettle corn on a healthier, tastier level. Popcorn is a great low calorie snack, quick to make, and easy to take on the go or smuggle into movie theaters. Make sure the kernels you purchase are Non GMO & Organic. Genetically modified corn is a horrendous ingredient and should really be avoided altogether. If you haven’t seen & rented the documentary Genetic Roulette, it’s a must watch. What a great excuse to eat some popcorn, ay? Not to mention the kettle corn sold at the fair…. So good, yet I can’t help but think of how sugary each bite of that stuff is. Really, who needs to eat a bag of popcorn 1/3 of their body height anyway? 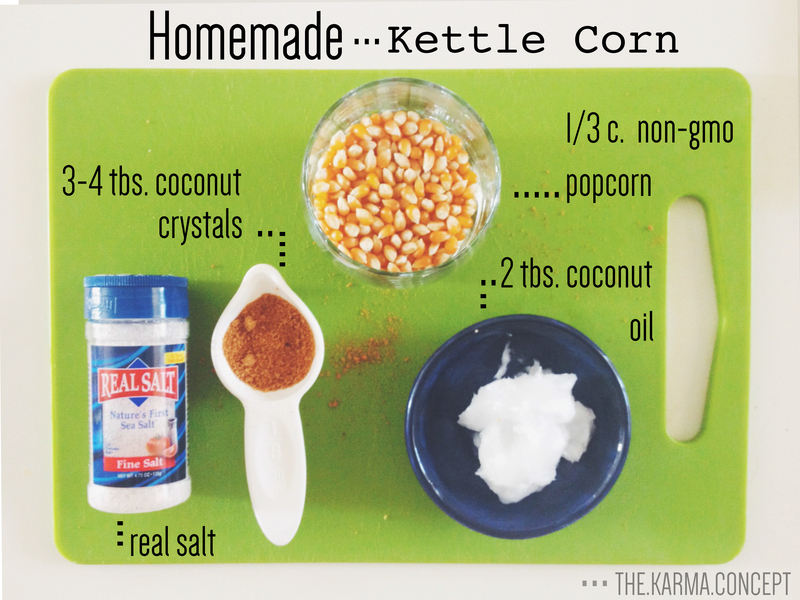 Using coconut crystals keeps the sugar content low on this kettle corn, with only 4 grams per tablespoon. Feel free to use more or less, depending on your own body’s response to sugar. We purchased 3 lbs. for $12, so it’s a pretty inexpensive switch to make in your own kitchen. 1. Heat coconut oil in pan w/ lid on. 2. Pour kernels in oil when it starts bubbling. making sure they don’t burn. 4. Continue shaking as they pop. & drizzle in melted coconut oil or grass fed butter. 6. Sprinkle coconut crystals and a dash of salt. Be sure to also try Food Babe’s Superfood Popcorn and let me know what other combinations to try.